Mary Baldwin was thirteen years of age when her father died in 1888. As the eldest daughter, she was needed at home with her mother to keep the large house in order and to look after the younger children, especially since they could no longer afford to keep servants on a regular basis. Except for brief vacations in Muskoka, or other parts of Ontario, and a trip to the Continent in July 1914, she remained at home. Therefore, there are very few letters from, or to, Mary, they are mostly token notes on special occasions, and their tone is often somewhat hurried and perfunctory. She was attractive and intelligent but not scholarly. 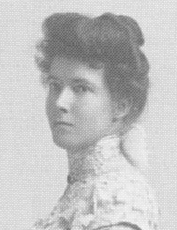 She was active in the Church and Missionary work with her mother and held executive office in the auxiliary. She was as moralistic as her mother and reflected her fundamentalist views. There is no record that Mary ever became involved in a serious relationship with a man. Indeed, her mother deemed her unsuitable for marriage: "M.[Mary] is not fitted for it at all, she has not head enough and there would be trouble" (W5654). Mary lived to the age of ninety. She and Hilda and Calvin signed Whitehern over to the City of Hamilton in 1959 and it reverted to the city in 1968 at the death of Calvin. She died in her 91st year, and is buried in the McQuesten plot in the Hamilton Cemetery.